Calicut International Airport celebrated the 80th birthday of His Holiness the XIV Dalai Lama on July 6, 2015. World over the day is celebrated as World Tibet Day. 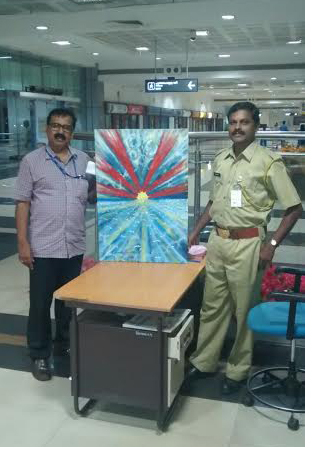 Celebrated Artist Shri Kodankandath Antony Francis, who is also the Superintendent of Customs Intelligence in the Airport unveiled a painting honouring His Holiness the XIV Dalai Lama on his 80th Birthday. The painting depicts the outlawed Tibetan National Flag with His Holiness the XIV Dalai Lama surrounded by 80 pigeons taking wings around the world, indicating the beginning of a new era of peace and harmony. Shri Francis, a long time supporter of the Tibetan Cause, spoke to the audience about the significance of World Tibet Day and the life of His Holiness the XIV Dalai Lama. Shri Francis is a recipient of the National Lalithkala Academy award (1993) and is known for his paintings about the Tibetan Cause. His 'Tibetan Dreams' presented to His Holiness the XIV Dalai Lama on his 69th Birthday showcased the Tibetan map formed with 69 butterflies trapped behind iron bars, representing a nation that has been converted into nothing but a colossal prison. During the visit of His Holiness the XIV Dalai Lama to Kochi on November 25 2012, Shri Francis held a painting exhibition 'Art of Happiness’ and presented his painting to His Holiness. The audience arranged by Friends of Tibet in Kochi, saw His Holiness talking on 'Art of Hapipiness' to members of Friends of Tibet and 'Wellbeing' Beneficiaries. Shri Francis has held solo exhibitions at Japanese International Cultural Cooperation Agency (Tokyo, Japan); International Centre for Theoretical Physics (Italy); New Heaven City Art Gallery (USA); University de-Joseph Fourier (Paris); River Date Art Gallery (UK); Newman Centre University of New Orleans (USA); Jahangir Art Gallery (Bombay); Alliance Francaise (Bangalore) and the Lalithakala Academy Art Gallery (Kerala). His paintings are in the collection of the late Mother Teresa, Medha Patkar and Padmashri Mohanlal. Shri Francis is currently working on Paintings based on the Tibetan Cause. What is more significant is the usage of Khadi material on which the painting is done. The painting would be exhibited at Jahangir Art Gallery, Mumbai, in the month of January, 2016.